Engagement rings are precious items, which is why it makes sense to look into the prospect of engagement ring insurance. All sorts of bad things can happen to engagement rings after the bent knee, among them loosened or lost stones, wear and tear, or even losing the ring. We have even seen rings get bent in a car door! Every day wear and tear can take it's toll on the safety of your ring. All of these items can be expensive to repair or replace so it's better to look to insurance to fix a dinged ring than to pay for it out-of-pocket. Guys, this is your responsibility. While some women might prefer to shoulder this expense for their own engagement rings, the task generally falls on the fellow who slips the ring on the girl's finger. You take care of her wedding and engagement rings and she (and her mom, and sisters, and aunts, and grandmothers) takes care of all the other details. Engagement rings can be insured in a variety of ways, one of which is through your standard homeowner's or renter's insurance. This is impossible to take advantage of, however, unless your betrothed is actually living with you. If this criterion is met then her engagement ring is at covered in the case of theft or some home-damaging event such as a tornado. Dropping engagement rings into a running garbage disposal or losing them outside the home generally isn't covered. If you look closely at your policy, you might even find that additional coverage for wedding and engagement rings can be added as a rider for a few dollars per month. Naturally, there will be a deductible but, nonetheless, don't sniff at the homeowner's option because in some instances it can be a lifesaver. After all, engagement rings are prime targets for thieves, which is why you'll find so many nice ones at pawnshops. You can also purchase insurance specifically for engagement rings, and you don’t have to go to Lloyd's of London to do it. Some insurance providers and jewelers are happy to write policies for engagement rings. You can acquire policies that cover the actual value of the ring, or even the amount that you value it at -- assuming such intangibles as sentimental value, heirloom qualities, or the time and trouble posed by replacement. The more common (and best) policies offered for engagement rings are those that provide for full replacement value. Since prices for precious metals and gems fluctuate, you might otherwise find that your engagement rings are worth much more than you paid for them and that you'll have to dig deep to replace them just as they were. Two companies that provide insurance specifically for engagement rings are the Chubb Group and Jeweler's Mutual. Unlike homeowner's insurance, there is usually no deductible, you'll get full coverage, the insurance is for anything that may befall your engagement ring (whether it falls into the disposal or drops off while you're diving in the Aegean Sea), and the replacement generally comes as a cash settlement, so you can pick where you want to buy your replacement ring. Expected to pay an annual rate of about $30-40 per $1000 value. 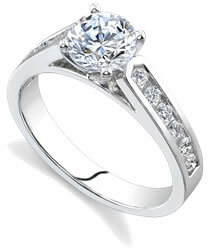 Before you balk, consider this: $300-400 really isn't so much to pay to replace a $10,000 engagement ring, now is it? Remember, wearing a ring every day will take it's toll on the ring. At Novori Jewelry we recommend that you have your diamond engagement ring inspected for safety at least every year and then have adequate insurance for the ring. Novori Jewelry is not responsible for any losses you might encounter and we know the world is a harsh place for a diamond ring. Keep your ring as safe as possible.